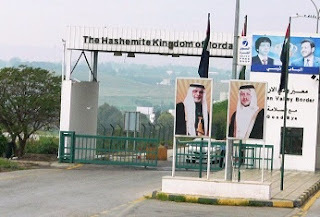 We signed up for a 9-day all-inclusive Holyland package tour in early April this year (2011) at a local tour-company (Royal Omania). The timing was based on the kid’s summer holidays (April-May) rather than on any particular touring season. June through September is the peak season with the three months on either side labeled the “shoulder season”. Pricing was Rs 60.5K (~$1350) for an adult with a Rs 5K (~$110) discount for children between 5 and 12. Compared to similar tours from the Western US and UK priced in the $3K range, this is less than half, but then so is the distance (below 3K miles compared to around 8K miles). Tour companies offering similar tours galore in Kerala, so competition probably helped. The day before the trip, a Royal Omania representative reminded us to carry umbrellas as light rain was expected during our trip. The rep mentioned to meet at the airport three-hours before the flight time but was unable to provide a contact number. A kit handed out at the airport included electronic ticket docs, a name-badge, and a baseball cap. Group check-in worked well at Nedumbassery Airport and that too with individual bag tags. It took nine hours to get to Jordan and the service level of our carrier, Gulf Air was OK. The wing to Bahrain took 4.5 hours and from there to Amman was another 2.5 hours with a two-hour break. Breakfast was served on both the flights and the Amman flight had the interesting option of fol – refried fava beans with no meat. 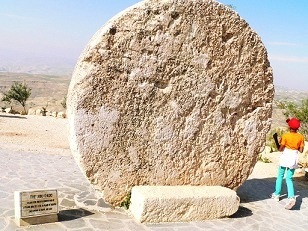 The flights were on time and we reached Queen Alia Airport in the southern outskirts of Amman on time at around 11:30 AM. The visa procedure went smooth – group visa with an arrival stamp in the passport. We had to while away 90-minutes at the airport before the group from Chennai could join us. A tour guide from Al Thuraya Travel and Tours escorted us to the tour bus (Volvo type low rise with AC). 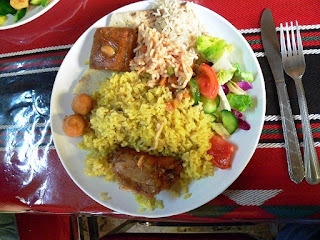 First stop after departure was at the Assa Mosa restaurant near Mount Nebo – Middle Eastern Buffett lunch with chicken, lemon rice, salads, pita bread, and dessert. 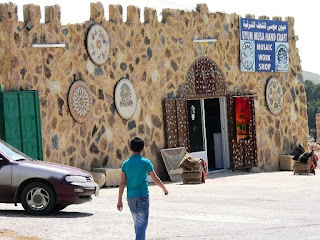 Adjacent to the restaurant is a curio store (Uyun Musa Hand Craft) where good mosaic art pieces were upwards of $25. The view across from the restaurant is fantastic - the Promised Land, Moses Springs (Uyun Musa), and the Dead Sea. A new church was being built in the area at the time of our visit (April 2011). Pope John Paul II visited the place in 2000 AD – he planted an olive tree near the Byzantine church as a symbol of peace. 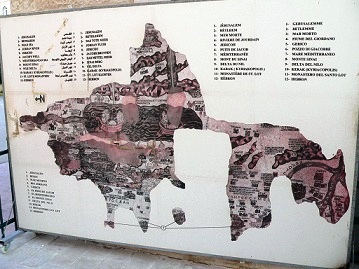 A small museum in the property features mosaics from the Kayanos Church from the Byzantine period along with other mosaics. 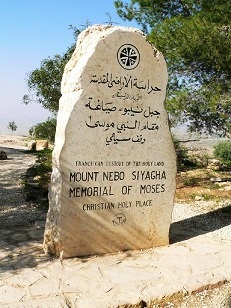 Abu Badd, the rolling stone used as a fortified door of a Byzantine monastery, a memorial stone for Moses, and a large stone with carvings remembering Pope’s visit are other sites of interest within this property. Our next stop was the Virgin Mary Church and the Archaeological Park of Madaba. 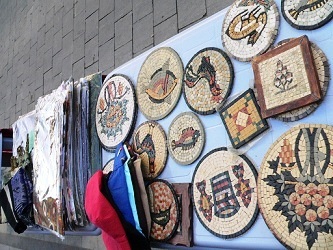 A large number of mosaic monuments were rediscovered in the northern part of the city, giving it the name “City of Mosaics”. 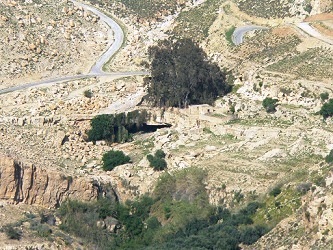 The area crossed by the colomnaded Roman road (cardo) has the Church of the Virgin Mary, the Church of Prophet Elijah with its crypt, the Church of the Holy Martyrs (Al-Khadir), the Burnt Palace, and the Church of the Sunna’ family. 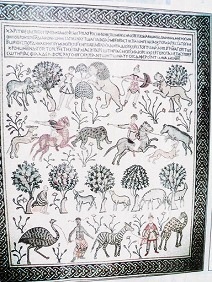 Some mosaics found in the Church of the Virgin and the Apostles depict an assortment of flora and fauna and general life scenes – one that really caught our eye was the progressive depiction of people from all races (whites, blacks, etc) killing wild animals followed by their domestication, and finally using them in transportation. A short walk took us through several shops selling mosaics and other curios where we took a 10-minute shopping break. Our first night's stay was at the Amaken Plaza Hotel, a 3-star hotel at the end of Queen Rania Al-Abdullah Street. It is located on a busy street – rooms facing the road can be quite noisy while the inside ones are fine. Welcome drink and bell service went flawless. Buffet dinner had a good selection (chicken, pasta, salads, soufflé, jello, etc.) although service was a bit indifferent. Buffet breakfast the following morning also had a varied selection (mashed potato, gravy, pita bread, egg, ham, cheese, olives, oj/coffee/tea, cake, sour cream, etc.). The following day started with a 2-hour journey to the Israeli border crossing Jordan River at Sheikh Hussein Bridge. The process of crossing the border was smooth but time consuming – as one has to remove all baggage and go through security twice (Jordan and Israel) - it took additional time on the Israeli side for some people when they did some extra checking for people with US passports living in India but working outside India. 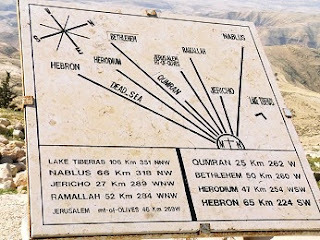 A new tour bus and guide was waiting on the Israeli side of the border and we proceeded with the next item in our itinerary. All in all, the Jordan portion of the tour was lovely although we felt it was much too short.